Longtime television reporter Roger Weber has joined Birmingham-based Bluestone Executive Communications as senior executive communication strategist and media trainer. Weber, who for more than three decades reported major news and feature stories at WDIV-TV (Channel 4), will provide media training, speech, and presentation coaching and corporate videos to clients. He was also a long-time adjunct professor at Oakland University. 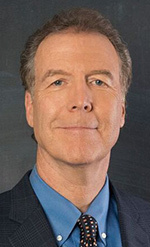 Weber’s honors include the Edward R. Murrow Award and his membership in the Silver Circle of the National Academy of Television Arts and Sciences. WDIV-TV has established the annual “Roger Weber Award” to be given to journalists who follow his example. Weber earned his bachelor’s degree in journalism at Bowling Green State University.